“Let them do it.” This was the constant mantra that Joe a retired NYC math teacher turned math coach repeated often to me during the classroom management struggles of my third year. At the time I was hoping to write material relevant to my South Bronx classroom by pulling from a different textbooks and 2007-era Google searches. Joe followed a similar routine when he made material to teach his East Harlem population using whatever people used in the early 90s. He quickly noticed something off about my tasks that I wouldn’t realize until after a few months working together. My efforts to control student behavior had seeped into a lot of the work that I had them do. Students weren’t doing the work of solving real problems, or making real connections with their prior math knowledge. Instead they were walking down these narrow pathways of my own thinking. That’s exactly what I thought would help them, but in reality, I was doing them harm. My teaching moves were as constricting as my curriculum, but I thought that this was necessary. My student population posed a lot of behavior and academic challenges. Changing the focus from my thinking to their thinking allowed me to stop worrying about their math levels or 8th grade scores and instead on how to build off the last lesson so kids really learn. When kids made mistakes, I typically told them what to do as clear and fast as possible. Joe, as politely as he could, shut that down. Instead he’d ask me to start a conversation up at the front of the class to dissect the student error. He once said: “MAKE SURE THAT YOU NEVER, NEVER, NEVER GIVE AN ANSWER AND DON’T COMMENT ON ANY WRONG ANSWERS. Students will learn more from wrong answers that they discover themselves than they will if you tell them.” This is a quote from one of his emails, with his emphasis by the way. He continues, “They have been trained to look to the teacher to verify their answers and we want them to start depending on their own evidence for confirmation.” It was weird realizing that I was playing into this pyramid scheme of answer-getting, with the kids’ help, and preventing them from building their own critical thinking skills in the process. In trying to keep order, and keep my administrator from seeing chaos spill into the hallway, I played the answer giver that kids seemed to want, not the math teacher they needed. To get students to do the kind of work they needed to build their thinking skills, I needed new tasks and new practices. One task Joe gave me that I still use today is Tina’s quilt squares. This task was, open, visual and had exactly the kind of thinking my kids needed to do. The old Carl would have totally strangled the joy out of this. Taking his advice, I “let the kids do it.” The class was as quiet as any of my lectures as they all worked to find pattern. Some kids approached the task by actually drawing out each stage of the pattern. Others probed the tables for patterns in search of a larger explanation. These two types of student thinking were so interesting that I tried to validate both of them at the necessary end of class discussion and it became very clear which people should be presenting, and what I should, and shouldn’t, say about their thinking. (i) The point of solving problems is to understand mathematics better. (ii) The point of understanding mathematics is to become better able to solve problems. This creates a useful distinction of two kinds of math doers, the theory-builders and the problem-solvers. My first years was a time where I was torn between needing my students to become problem-solvers and wanting them to be theory builders. I was so focused on helping the students solve problems like being on the test, that I didn’t have time to let them really build the theory, so I figured I could do it for them with my awesome worksheets. The two styles seemed to be avenues for the kinds of approaches that students could work on and the kind of thinking that students could show in their student work. Looking back on it now, it was clear that I really didn’t understand what it meant for students to be problem-solving, theory-building, or doing mathematics in the first place. Require complex and non-algorithmic thinking. Require students to explore and understand the nature of mathematical concepts, processes or relationships. Demand self-monitoring or self-regulation of one’s own cognitive processes. Require students to access relevant knowledge and experiences and make appropriate use of them in working through the task. Require students to analyze the task and actively examine task constraints that may limit possible solution strategies and solutions. Require considerable cognitive effort and may involve some level of anxiety for the student due to the unpredictable nature of the solution process required. The kinds of tasks that can fit into “Doing Math” could be either theory-building or problem solving, and possibly both. 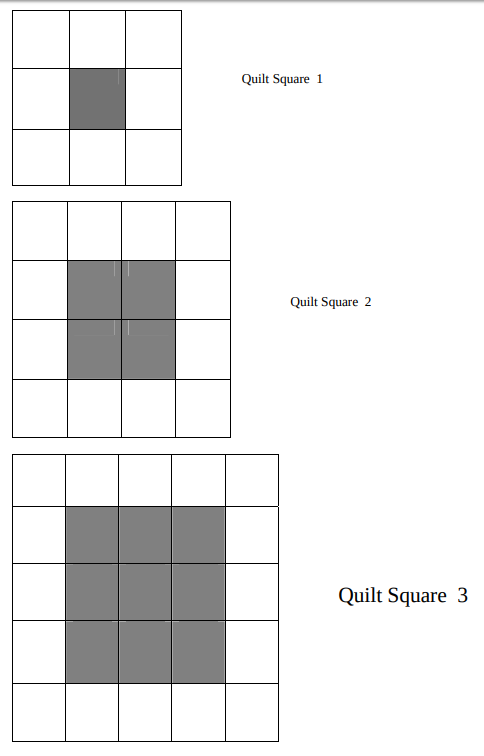 Tina’s quilt square was my first example of such a task, and seeing it first hand changed the rest of my teaching career. Students were doing complex thinking, analyzing the result, using multiple solutions. The kind of tasks I was doing before Joe would fall under the task guides memorization and procedures without connections, with little focus on making connections or, well, anything in that “Doing Math” category. Before Joe, I spent hours doing the theory-building, and the problem solving for my kids. I then packaged up my results in a way that would help students easily retrace my steps. They didn’t see how these steps are useful, as they didn’t approach a real problem. They didn’t see how these steps could be built from prior understanding, as we only talked about theory superficially. All my efforts were going towards weren’t going towards making good future mathematicians, but good retracers. It stayed that way because any thoughts about doing things differently would throw my pacing off. It wasn’t until Joe’s frank meetings, and All-Caps emails, that I realized my current style had to change. The whole point in going to teach on the east coast was to change the world with my teaching. Helping kids learn math seemed like the best path towards that goal because it could improve their test scores and make them eligible for higher education opportunities. Yet, I was lying to myself when I thought that it was enough for my class to do well on tests. My failed first test of calculus was proof that kids who do well on tests can still struggle at the next level. The right goal would be to make kids mathematicians. To help them actually learn how to solve big problems and make the connections needed to build theories. The application of those skills lies beyond just the math classroom, but can be actually used to think about tackling larger social problems and skills. The only way to get to my larger goal would be to not just teach Tina’s Quilt Squares the way Joe did, but to change my own thinking about my profession so I could make my own tasks to give to my future mathematicians. After Joe, I sought to approach the the task of teaching my classes as my kids approached the task of learning algebra. I approached it like a problem-solver, looking to try and solve lots of little problems while simultaneously looking to connect big ideas and make sense of things like a theory-builder. Just like my students began to learn from each other and work things out in conversations, I began to talk with Joe and later other educators which helped me develop my practice. This was before I found the #MTBoS or joined NCTM or MFA, so this took a lot of time. Luckily Joe, and my Principal allowed to approach the task of improving as a teacher without having to retracing some steps or memorize some procedures, as it is probably the reason I’m spending another fall preparing to teach. In writing this piece, I read W.T. Gowers 2000 article about The Two Cultures of Mathematics, of which I understood about 65%. I do know that is not about K-12 schools and what goes on there, but is actually a bit of a call two action about two cultures that exist among people in the field of mathematics. The prominent theory-builders belong to a culture that studies the fashionable ideas which are at the center of that field, while problem-solvers work around the periphery. This distinction reminded me a lot of math education. It feels like there is a prominent culture of around that approaches things in the old ways, like in this recent pro-memorization NYT article. Meanwhile the world seems to ignore ideas that come from problem-solvers working around the periphery in classrooms like Joe working with me. The problem-solvers Gowers describes, who were creating the field of combinatorics, could actually benefit the theory-builders with their unique ways to solve problems. Technological advances would allow for major advances in combinatorics and math as a whole as the two cultures learned to collaborate and move the field forward. Hopefully writing this story of what happened in a cramped South Bronx classroom, might describe a different approach to how to improve teaching and learning. And hopefully the larger conference that it is a part of could promote the kind of collaboration across the world of mathematics education that has been seen among the problem-solvers and theory-builders of mathematics.